If you are frequent Amtrak rider, you are probably aware of Amtrak Guest Rewards (“AGR”) – the agency’s rider-rewards program. Since 2000, AGR has been like traditional travel-related bonus programs, where one earns points for every trip taken. Except one major difference – unlike the airlines, you could actually use your points for trips much sooner, not having to amass some ridiculous point threshold, being lucky if you could take a short-haul flight in your lifetime. However, last fall, AGR began promoting a revised program, to be effective Sunday, 24 January 2016. Under the guise of everything needing a “tune-up,” the new program contained many celebrated and reasonable changes. Such were the 1,500-point minimum elimination for trip redemption, replaced with an 800-point minimum; the ability to use points and other payment methods concurrently for travel; as well as, using points to now purchase 10-ride and monthly passes – all big deals for AGR members. There was one change, however, that has struck a nerve with me, not simply because it has drastically effected my point earnings and my status with AGR, but because I feel it explicitly discriminates against senior, disabled and other discount members in earning AGR points. The old, pre-2016 program had a “100-point minimum” for every trip taken. No matter where you went – how close the origin and destination, you received 100 points for that trip. As someone who principally takes the Capitol Corridor from Sacramento to Davis for medical appointments – and prior, for attending U.C. Davis, I typically amassed around 300 of these trips annually; thereby, making me a “Select Executive” AGR member. While I also would take this same route to the Bay, the San Joaquins to Los Angeles, and the Pacific Surfliner or Coast Starlight along the coast, my SAC-DAV trips were always the overwhelming majority of points earned. Now with the 100-point minimum eliminated, seniors, the disabled, and even veterans and their families do not earn the same as those paying full fare. The riders listed, while given a discount – as they deserve, with AGR new system, one is not rewarded the same as other full-paying AGR members. This is especially disturbing, given many of these passengers are limited-income – students, seniors, the disabled, etc. Simply put, the new AGR program eliminated the previous system of equity for discounted passengers. Although the 100-point minimum was equitable for $50 or below fares, it was still in place, providing relief – and dare I say it, a sense of dignity – for discounted passengers, whether AGR explicitly designed it that way or not. Today, while a full-fare passenger would receive 18 Tier-Qualifying Points for a SAC-DAV trip, I would only receive 15. As stated earlier, to obtain “Select Executive” status, one needs to amass 20,000 TQPs. Under the new system, a full-fare passenger would need to take 1,111+ SAC-DAV trips in one year to make Select Executive, while I – and other students, seniors and disabled – would have to take 1,333+ trips, a difference of 222 trips. Consider that under the old system, 200 SAC-DAV trips would have been enough to make Select Executive AGR status. First, I am very thankful for AGR being in place. A public-sector rewards program is a rarity, and I enjoy that my environmentally-superior transit forms is so rewarding. As well, I am well-aware that these programs – public or private – continuously adjust to better financially favor the organization; hence, making it harder for the member / consumer to use their rewards. Such is the market system we live in. However, as we at TransportiCA know, “equity” is one of three elements for something to be considered “sustainable.” With AGR’s removal of the 100-point minimum, and in this regard, the new AGR system is anything, but sustainable. If AGR wants to call its system that term, using all three elements for such designation – financial, ecological and social equity, discounted passengers should receive the same amount of TQPs as full-fare passengers. PLAIN AND SIMPLE. Until then, AGR cannot be called sustainable, as it expressly punishes students, seniors, veterans, the disabled, and others. We have reached out to AGR and Amtrak for comment and will keep you posted. UPDATE: This issue was sent to both California Senators earlier this year. Sen. Boxer did not respond - as was expected, and Sen. Feinstein's office gave an incredibly pathetic response. (See below.) We would have had more respect if her office would have just said, "we could care less about you." 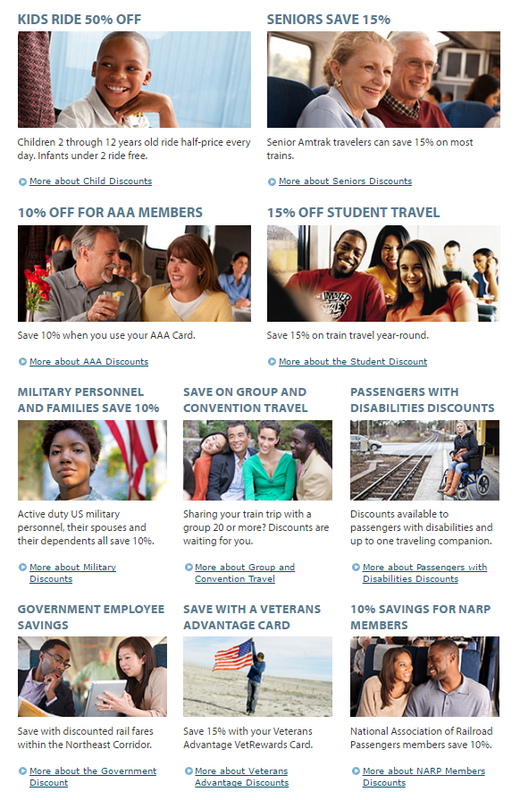 By the way, Amtrak is a federal agency - National Passenger Rail Corporation, created by Congress in 1970.